Boston Market’s corn bread is my favorite and I’ve always wanted to bake something similar at home. I found a corn muffin recipe in The Taste of Home Baking Book. Later traced the recipe on the website too. As I have mentioned in the blog a couple of times before, I love that website because all the recipes work like a charm. Nothing can go wrong. 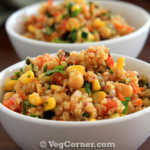 I’ve seen a couple of recipes for corn muffin, but this one was very simple to follow and easy to veganize also. These muffins can be prepared in no time. I have used Ener-G egg replacer in place of the 1 egg in the original recipe. Also I used non-dairy milk to make vegan corn muffins. I would rather prefer using rice milk or almond milk instead. 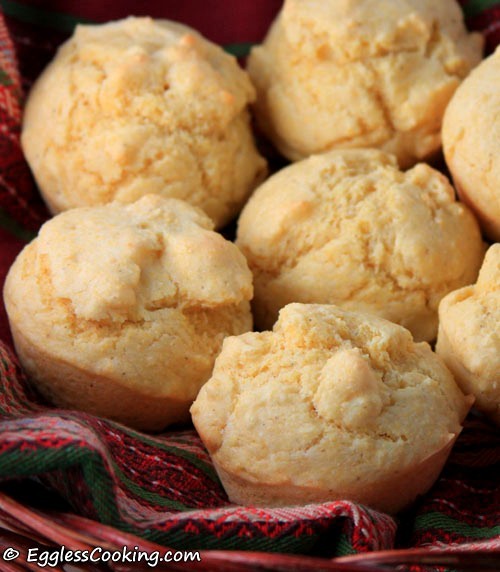 You can also use buttermilk instead of milk to make very moist corn muffins. Corn muffins are a good accompaniment for vegetarian chili or some hot lentils and vegetable soup. 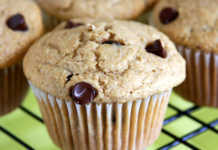 Everyone at home loved these muffins! 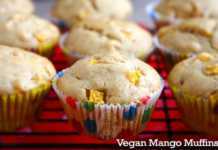 Wondering how to make easy egg-free/vegan corn muffins from scratch? You are in the right place. Check out this recipe for the best corn muffin recipe ever. Preheat oven at 400F/200C for 15 minutes. Grease muffin cups with shortening. In a large bowl combine the flour, cornmeal, sugar, baking powder and salt. 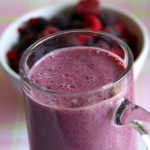 In a blender/food processor add Ener-G, water, milk and oil. Blend it thoroughly, for about 3 minutes. Stir into the dry ingredients just until moistened. Fill the muffin cups 2/3rds full. Bake for 16-18 minutes or until a toothpick comes out clean. I don’t have any complaints with this recipe. The only thing I wish I had done was spreading the batter in the 8 muffin cups evenly in the first go itself. I had some batter remaining after filling the cups initially, so distributed it again among the 8 cups. So what happened was after baking there was this extra top on the muffins. Not a big deal, but the corn muffins would have looked perfect and smooth on the top (just like the picture in the magazine) if I had done it the other way. 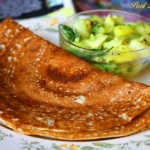 Adding some fresh/frozen corn kernels to the batter would be nice too. This is a general baking tip. I have found that greasing baking sheets/pans with shortening works better than using a non stick spray. Non stick spray leaves burn marks on the sheets while shortening does a clean job. 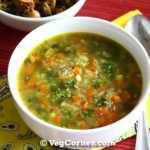 This recipe has been updated and republished from the 2009 archives. Great recipe and super easy! I added some blueberries to turn these into my new favorite breakfast treat. Wow! That’s great to know. I have never added fruits in corn muffin. I’ve made these three times and they turned out so light and delicious! But I made some substitutes and changes, because I was away from home and had to use what was available! Here goes: I used 1/2 cup white flour, 1 cup corn flour, 1/3 of which was masa harina. I used 2 1/2 tsp. Baking powder, because egg replacer has some in it. I didn’t have nondairy milk so used 2 Tablespoons soy flour, which I mixed in with the dry ingredients. Used a cup of water, and added 2 Tbsps. extra water, because of not having egg replacer or flaxseed there. The oil was coconut oil. I used less sugar, probably a Tbsp. Otherwise, the rest of the recipe as is! This is truly a wonderful recipe! Thank you for sharing! Wow! Amazing Donna! Thanks for sharing. I just took these muffins out of the oven. Delicious! I used flax egg in place of the EnerG and unsweetened almond milk in place of soy milk. Turned out great! I am visiting first time in ur space. Very innovative work. following u through google link. Do visit my blog too. I just did this. It was super good and my entire family loved it. So easy to make and great breakfast item. I just used whole milk because I didn’t have vegan milk and I also added a tsp of apple cider vinegar. Thanks a lot. Delicious! Tried many kinds of corn breads (with eggs) and were never as good as this one. I used WHOLE WHEAT flour, cow milk and added 1 cup of frozen corn. I cut the sugar in half. I used another brand of egg replacer so I had to adjust the amount and the water. Baked with parchemin lined muffin tins. Perfect snack for toddlers! Thanks for the feedback Anoushka. I just did this recipe and it was very good!!! Next time I would like them to be softer maybe by adding more oil? Thanks Sherie. I guess so, or else you can try baking it a minute or two less. Just made them and added some honey and extra TSBP of sugar and they were delicious. I would like them to be softer next time maybe I can add more honey. You’re welcome Helen and thank you for the tip for adding corn kernels. I’m going to try it too. Does anyone have experience with using sunflower oil instead of vegtable oil? My son has soy allergies so I need to avoid that. Coconut oil is expensive or else I would just keep using that. Thanks! I’m really excited to try this recipe. You can use any oil Audra, as long as it does not have an overpowering flavor. Hi mate please help me I want to make veggie muffins from courgette, carrots and onion. Help please. 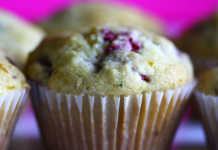 You can use this corn muffin recipe itself and mix in grated vegetables of your choice, upto a cup maybe. I want to try this recipe…without making an extra trip to the grocery store. Can I use applesauce in place of the egg replacer? Also, the type of sugar isn’t specified. Can I use turbinado sugar? I’m not sure if applesauce would work for this recipe. I used white sugar. Hi Toby, you could use any other non-dairy milk instead of soy. Switching that does not affect the taste or texture in anyway. Actually I personally prefer almond milk or rice milk instead of soy milk. Somtimes soy milk can give a gooey texture. So you should be fine using almond milk.